Most people buy a tablet because they need a device a bit bigger than smartphone, which can be used mostly for consuming media, games and browsing the Internet. Still, it needs to be compact enough, so they can carry it around with ease, that’s why, currently, the most popular are 7-inch and 8-inch tablets. Still, there is also a specific user category that wants the same features, while size is not an issue. In fact, the bigger the display, the better. For those user, the perfect choice is one of the many 10-inch tablets, which, fortunately, are available in a wide variety. If you’re in the same situation, looking for a new tablet, but can’t actually decide what to buy, then you’re in luck. 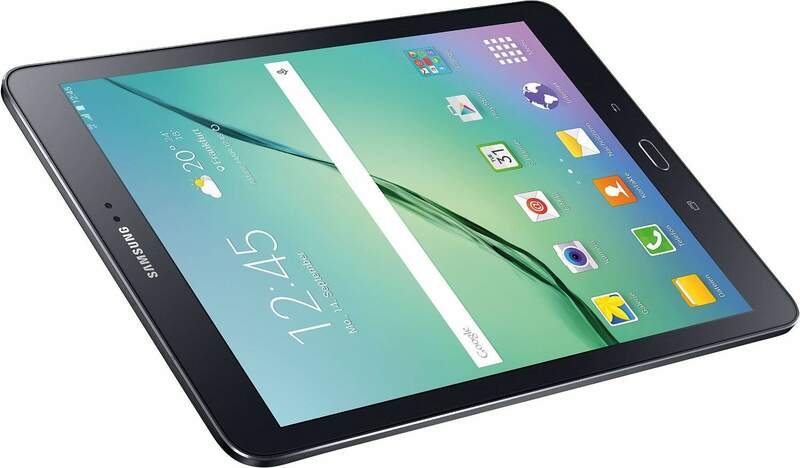 Below you can find a short list with 10 of the best 10 inch tablets you can currently buy. They’re arranged in a random order, featuring a spec sheet and a short presentation for each model. All the devices listed below can be bought from Amazon, using the yellow button alongside their name, at the mentioned price. There aren’t no affiliate links on the buttons, just the direct ones to the products’ pages. So, let’s start the guide, shall we? After being present in our Best 8 Inch Tablets top, South Korean manufacturer Samsung is back with another Galaxy Tab 4 model, but with a bigger display this time. Powered by Google’s Android 4.4.2 KitKat operating system, alongside an impressive spec sheet, it’s able to run the latest apps with ease. It comes with a 10.1″ TFT display, with 16 million colors and a resolution of 1280 x 800 pixels, delivering crisp and clear images. Under the hood, it has a Qualcomm Snapdragon 400 chipset, with four cores running at 1.2 GHz, aided by 1.5 GB of RAM. The storage capacity counts 16 GB, but it can be expanded with up to 64 more gigs, using a microSD card. On the back, it comes with a more than decent 3.15 MP, able to shoot 2048 x 1536 pictures and record 720p videos @30fps. The spec sheet is completed by GPS with GLONASS, Wi-Fi 802.11 a/b/g/n and Bluetooth 4.0. 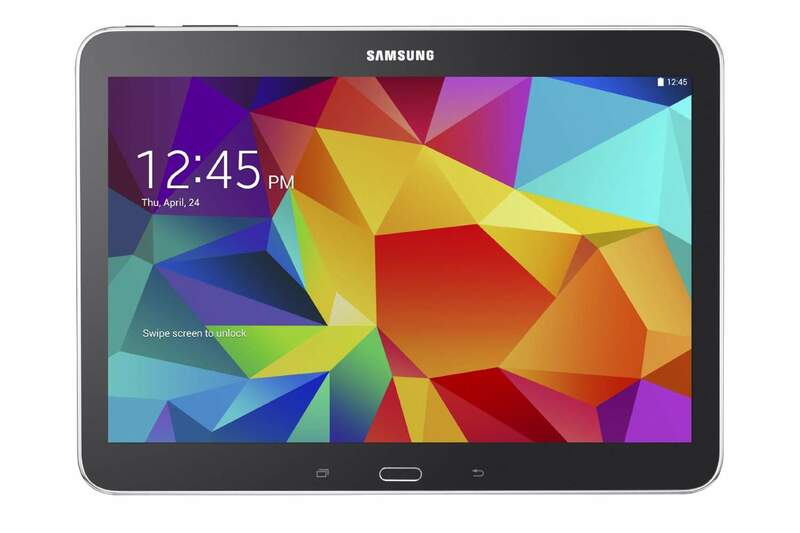 The Samsung Galaxy Tab 4 10.1 is available in White and Black. In order to find all the details about this tablet, check out the full Samsung Galaxy Tab 4 10.1 review. – Qualcomm Snapdragon 800 quad-core @ 2.3 GHz / Exynos 5 Octa 5420 octa-core @ 1.9 GHz and 1.3 Ghz. The next entry in our top is pretty much the best tablet Samsung launched in 2014. With a Super AMOLED display, measuring 10.5 inches and with a resolution of 2560 x 1600 pixels, it offers an excellent viewing experience, being one of the best 10 inch tablets for consuming media or gaming. The latter is possible thanks to the huge amount of tablet provided by this tablet. It comes in two variants, one equipped with a Qualcomm Snapdragon 800 chipset, with four Krait 400 cores, running at 2.3 GHz. On the other side, you can also get it with an Exynos 5 Octa 5420 chip, using four Cortex-A15 cores, running at 1.9 GHz, and four Cortex-A7 cores, running at 1.3 GHz, for less demanding tasks. No matter the version, the chipset is aided by 3 GB of RAM, while the internal storage counts 16 or 32 GB, depending on the version. It also offers the possibility of expanding this with up to 128 GB, using a microSD card slot. The camera department is represented by an 8 MP main snapper, with autofocus and LED flash, able to take 3264 x 2448 pictures and shoot 1080p videos @30fps. On the front, it comes with a 2.1 MP sensor, perfect for quality video calls with your friends and family and, why not, some quick selfies. The tablet also comes with Wi-Fi 802.11 a/b/g/n/ac, Bluetooth 4.0, GPS with GLONASS and an infrared port. 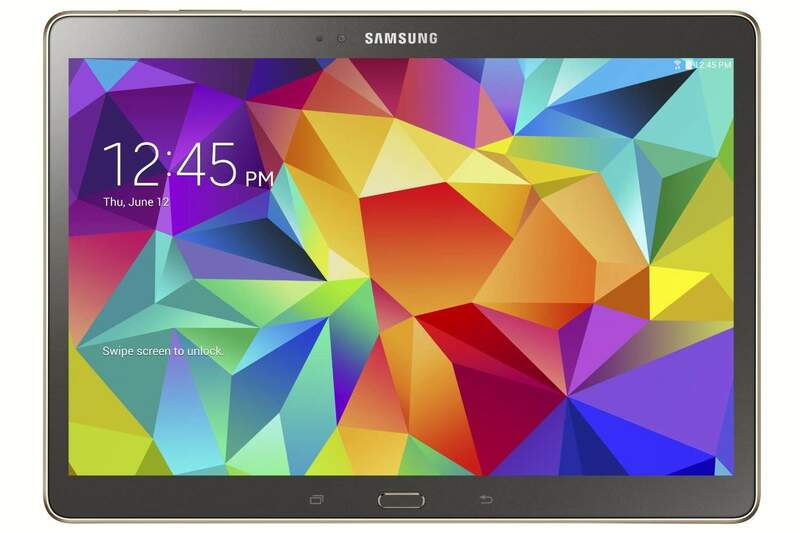 The Samsung Galaxy Tab S 10.5 is available in Dazzling White and Titanium Bronze. In order to find all the details about this tablet, check out the full Samsung Galaxy Tab S 10.5 review. The next entry in our top is one of the cheapest, but in the same time best 10 inch tablets under $200 on the market. 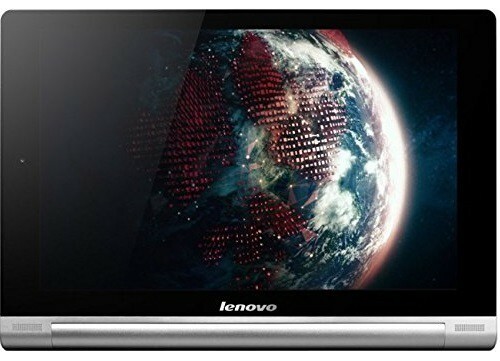 The Tab 2 A10-70F from Lenovo has a pocket-friendly price tag, but the specs and feature allow us to compare it with way more expensive models. It comes with a 10.1″ IPS LCD display, with a resolution of 1200 x 1920 pixels and able to deliver 16 million colors. It’s powered by an entry-level chipset, MediaTEk MT8732, with a quad-core configuration, running at 1.7 GHz and aided by 2 GB of RAM, enough for running even the most demanding apps of the moment and Android 4.4 KitKat, with no issues at all. The tablet has just 16 GB of internal storage, but you can add a maximum of 64, using a microSD card. Otherwise, if you still need more, you can always opt for cloud storage. It has an 8 MP rear camera, with autofocus and able to shoot photos at a maximum resolution of 3264 x 2448 pixels. On the front, the 5 MP camera delivers great video quality during calls. Finally, the spec sheet is completed by the Dolby Atmos sound system, Wi-Fi 802.11 a/b/g/n, Bluetooth 4.0, GPS, FM radio and accelerometer. The Lenovo Tab 2 A10-70F is available in Pearl White and Midnight Blue. 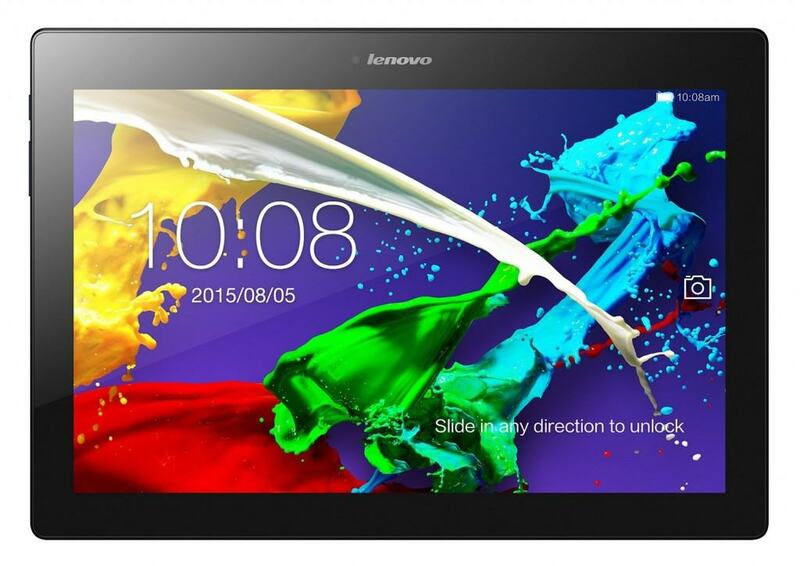 In order to find all the details about this tablet, check out the full Lenovo Tab 2 A10-70F review. 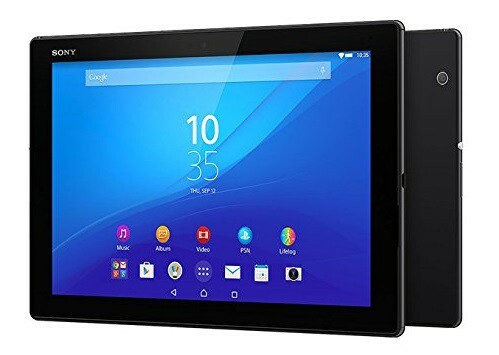 Number 4 on our list is a tablet released just two months ago, which is actually Sony’s flagship model, the successor to last year’s Xperia Z3 Tablet compact, present in our Best 8 inch tablets top. Thus, the price, higher than models with a similar screen size, is justified. The Xperia Z4 Tablet features a 10.1″ IPS LCD Triluminostouchscreen, with a QHD resolution of 2560 x 1600 pixels, and using the X-Reality engine, therefore delivering incredibly crisp and clear images. Like most high-end tablets of the moment, it’s using Qualcomm’s Snapdragon 810 chipset, with an octa-core configuration, including four Cortex-A53 cores, running at 1.5 GHz, and four Cortex A-57 ones, running at 2.0 GHz. It also has 3 GB of RAM and an internal storage capacity of 32 GB, but the latter can be expanded with 128 more gigs, using a microSD card. In terms of camera, the tablet is equipped with a 8.1 MP rear snapper, using a Sony Exmor RS sensor, with autofocus, touch focus and face/smile detect. It’s able to take 3264 x 2448 pixels photos and shoot 1080p videos, @30fps, including HDR. On the front, the 5.1 MP camera will deliver some great looking selfies. Since it’s a Sony product, it’s IP68 certified, which makes this tablet dust and water proof, up to 1.5m, for 30 minutes. It’s running Android 5.0 Lollipop and the spec sheet also includes Wi-Fi 802.11 a/b/g/n/ac, Bluetooth 4.1, GPS with GLONASS, NFC and FM radio with RDS. The Sony Xperia Z4 Tablet is available in Black and White. In order to find all the details about this tablet, check out the full Sony Xperia Z4 Tablet review. Taiwanese manufacturer Asus isn’t making just one of the best 7 inch tablets of the moment, the Memo Pad 7, but they’re also very good at making bigger devices, with pocket-friendly prices. Also, despite the relatively low price, the tablet still manages to sport some pretty impressive specs. There’s no doubt that the biggest plus of the Memo Pad FHD10 is the 10.0″ IPS LCD display, with a full HD resolution of 1920 x 1200 pixels. Using Android 4.3 JellyBean, customized with Asus’ Waveshare UI, the tablet is powered by an Intel Atom Z2560 chip, with a dual-core CPU, running at 1.6 GHz, PowerVR SGX544MP2 GPU and teaming with 2 GB of RAM. The tablet has an internal storage capacity of 16 or 32 GB, depending on the model, while the microSD card slot gives you the possibility to add up to 64 more. The tablet comes with a 5 MP main camera, which can be used for taking photos at a maximum resolution of 2592 x 1944 pixels, while on the front, it has a 1.2 MP snapper, just enough for a decent video call. It also has Wi-Fi 802.11 a/b/g/n, Bluetooth 3.0 and GPS with A-GPS. The Asus Memo Pad FHD 10 is available in Royal Blue, Silk White and Vivid Pink. 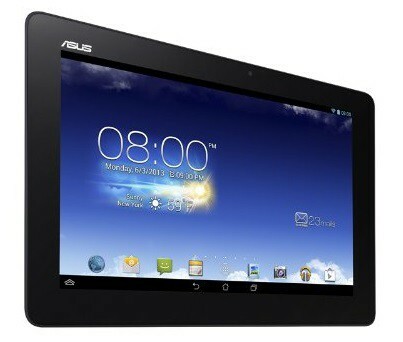 In order to find all the details about this tablet, check out the full Asus Memo Pad FHD 10 review. The most expensive tablet in our top so far, the Lenovo Yoga Tablet 10 HD+ is also one of the most interesting models in terms of looks. Thanks to the built-in kickstand, you can use it in three different modes and even hang it on a wall, if you want to make a presentation. Also, the stereo speakers, place on both sides of the stand, using the Dolby Digital Plus technology, are able to deliver an impressive sound experience. Under the hood, it has a Qualcomm Snapdragon 400 chipset, with a four Cortex-A7 cores, clocked at 1.6 GHz, alongside an Adreno 305 GPU and 2 GB of RAM. It has 16 or 32 GB of internal storage, but this can be expanded with 64 more, using a microSD card slot. On the back, the Yoga Tablet 10 HD+ has an excellent 8 MP camera, able to take 3264 x 2448 photos and shoot 1080p video. On the other side, the front-facing camera is a bit disappointing, using just a 1.6 MP sensor. Finally, it also comes with Wi-Fi 802.11 b/g/n, GPS, Bluetooth 4.0, accelerometer and a compass. 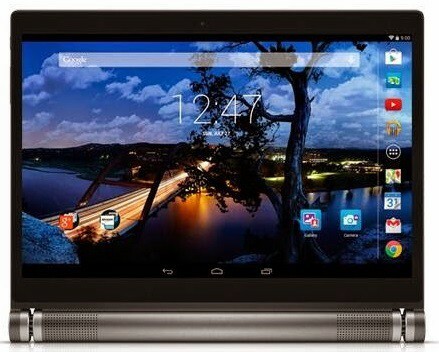 The Lenovo Yoga Tablet 10 HD+ is available in Metallic Gray. In order to find all the details about this tablet, check out the full Lenovo Yoga Tablet 10 HD+ review. One of the latest additions to Acer’s portfolio, introduced this summer, the Iconia Tab 10 A3-A30, is another cheap, but very good 10 inch tablet. For less than $300, you’re getting an Android 5.0 Lollipop-powered device, with a 10.1″ full HD display, protected by Corning’s Gorilla Glass 4 and an impressive pixel density of 224 ppi. It’s using an Intel Atom Z3735F chipset, with a quad-core processor, running at 1.33 GHz, and 2 GB of RAM, while the internal storage can count 16, 32 or 64 GB. Additionally, you can add a microSD card and expand this with up to 128 more gigs. The camera department is represented by a 5 MP rear snapper, taking pictures at a maximum resolution of 2592 x 1944 pixels and shooting 1080p videos. Also, on the front, the tablet has a 2 MP secondary camera, good enough for a quality video call. Finally, other specs worth mentioning are the stereo speakers, with Dolby Digital Plus audio technology, Wi-Fi 802.11 a/b/g/n/ac, Bluetooth 4.0, GPS and NFC. The Acer Iconia Tab A3-A30 is available in various colors, including Black and White. In order to find all the details about this tablet, check out the full Acer Iconia Tab A3-A30 review. As mentioned in our Best 7 inch tablets top, Dell’s latest line-up of Venue tablets is more than excellent, offering impressive specs at a great price. Naturally, the Venue 10 7000 is no exception, packing a great amount of processing power and looking very good in the same time. The 10.5″ OLED display has a a resolution of 1600 x 2560 pixels, resulting an density of 288 ppi, so the images will be vivid and clear. With an Intel Atom Z3580 chipset at the core, using a quad-core processor, clocked at 2.3 GHz, alongside a PowerVR G6430 GPU and 2 GB of RAM, this tablet is able to run even the most demanding apps or Android 5.0 Lollipop flawlessly. The total storage capacity can reach 544 GB, as besides the 32 internal storage, you can add a 512 GB micro SD card, being more than enough for all the files you can think of. The 8 MP rear camera, with autofocus, is using the Intel RealSense 3D technology and it’s able to take 3264 x 2448 photos and shoot 1080p video. Also, the 2 MP front snapper is great for video conferences and quick selfies. Finally, the tablet also has Wi-Fi 802.11 a/b/g/n/ac, Bluetooth 4.0 and GPS. The Dell Venue 10 7000 is available in Black. In order to find all the details about this tablet, check out the full Dell Venue 10 7000 review. The Galaxy Tab S2 is the upgraded version of last year’s Tab S, packing even more power than its predecessor and sporting an incredibly thin design, with a profile measuring just 5.6 mm. Considering that it looks so good, it would’ve been a shame to not have a high-end spec sheet too, but fortunately, it’s not the case. It comes with a 9.7″ Super AMOLED display, featuring a resolution og 1536 x 2048 and resulting a density of 264 ppi. The tablet is powered by an octa-core chipset, with four 1.9 GHz core, while the other four cores are clocked at 1.3 GHz, being designed for less-demanding tasks. The CPU is aided by 3 GB of RAM and the storage capacity counts 32 or 64 GB, depending on the model. Still, for those of you who need more space, Samsung has loaded the Galaxy Tab S2 9.7 with a microSD card slot, so you can add 128 more GB. It also has an 8 MP camera on the back, with autofocus, taking pictures at a maximum resolution of 3264 x 2448 pixels and shooting 1440p videos @30fps. The front camera is using a 2.1 MP sensor. The tablet comes with a fingerprint sensor, with multiple uses, alongside 802.11 a/b/g/n/ac Wi-Fi, Bluetooth 4.1, and GPS with A-GPS, GLONASS. The Samsung Galaxy Tab S2 9.7 is available in White, Black and Gold. In order to find all the details about this tablet, check out the full Samsung Galaxy Tab S2 9.7 review. The cheaper version of the Galaxy Tab S2 9.7, Samsung’s Galaxy Tab A 9.7 was also launched a few months ago, at a very good price for a big tablet, alongside a nice spec sheet. Powered by Google’s Android 5.0 Lollipop, customized with the TouchWiz interface, the tablet is using a quad-core processor, clocked at 1.2 GHz, alongside 1.5 GB or RAM (the LTE version, a bit more expensive, has 2 GB) and 16 or 32 gigs of storage. Also, the latter can be expanded with up to 128 more, thanks to the microSD card slot. For photography enthusiasts, it has a decent 5 MP camera on the back, with autofocus, geo-tagging and being able to take 2592 x 1944 photos and record 720p videos @30fps. The front camera is using a 2 MP sensor. Finally, the tablet comes with Wi-fi 802.11 a/b/g/n, Bluetooth 4.1 and GPS with A-GPS. 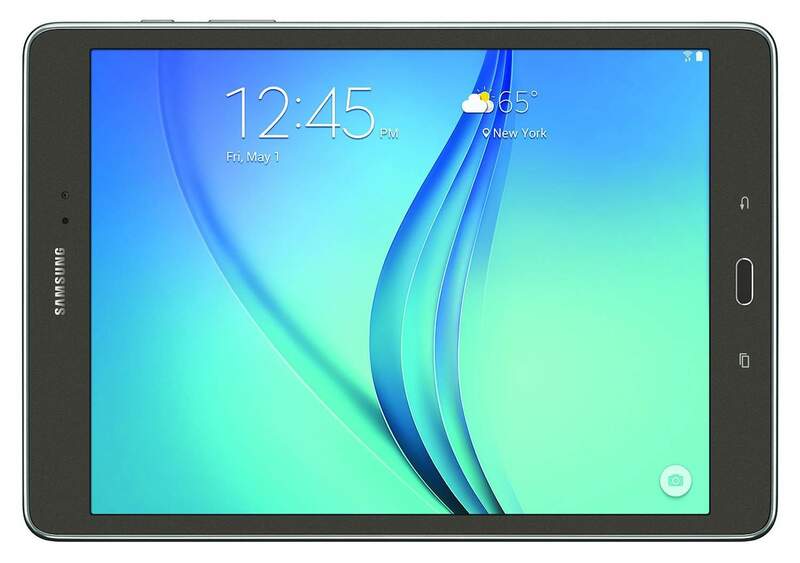 The Samsung Galaxy Tab A 9.7 is available in Smoky Titanium, Smoky Blue and White. In order to find all the details about this tablet, check out the full Samsung Galaxy Tab A 9.7 review. And there you have it, 10 of the best 10 inch tablets of the market. Like always, if you know any other models sporting the same display size, feel free to tell us about them, using the comments section below. Also, keep an eye on our blog, as another top is on its way, focusing on cheap tablets, with a price tag under $150, perfect for those with a small budget. In the mean time, don’t forget to check out our previous tops, Best 7 inch tablets and Best 8 inch tablets.